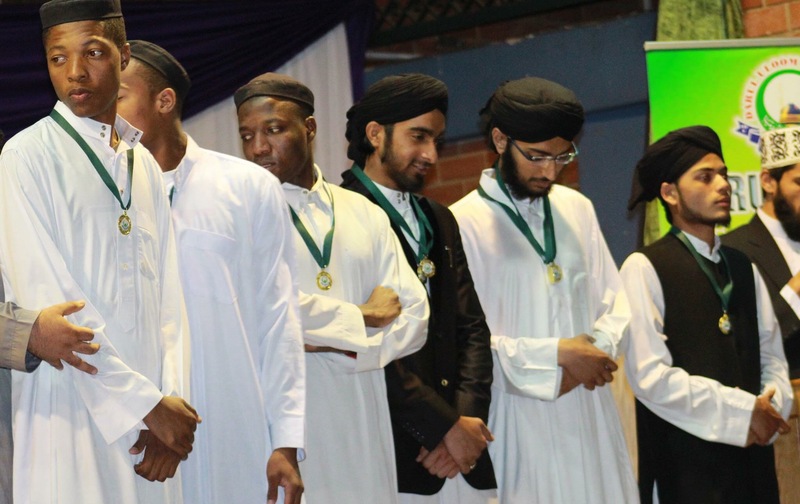 The Darul Uloom Pretoria’s Annual Qiraat, Na’at and Lecture competition was successfully held on Saturday night, the 21st November 2015 at the Laudium Civic Centre. Professor Dr Noor Ahmed Shahtaz and Allama Peer Sayed Muzammil Hussain Shah were the chief guests among a large number of Ulama and dignitaries. The different categories of the competition were judged by prominent Ulama, Qurra & Naat recitors who are recognized for their expertise in their respective fields. The judges were experts in their fields. The high quality of the items delivered by the respective students is indicative of the training they receive from their educators at the Darul Uloom. The audience were captivated by each of the students who presented Qiraats, Na’at and lectures in the Arabic, Urdu and English languages. Some of the students who competed in the lecture competition. 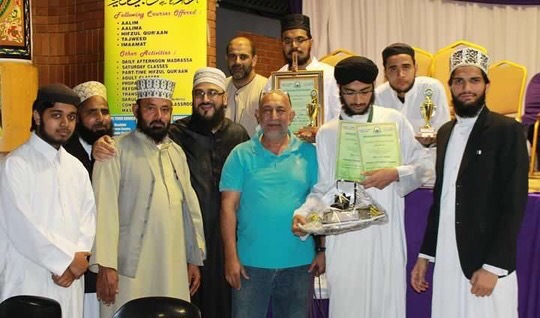 Hafiz Ali Bemath, who was amongst the graduates of the year 2015, achieved first position for his brilliant arabic lecture. All participants were awarded with medals whilst the top three students were awarded with trophies for their respective positions. A special gift and award was also presented to the outstanding student for the year 2015, Mohammed Furqaan Nikoria. Hafiz Furqan is pictured here with his educators, fellow students and volunteers at the institute. 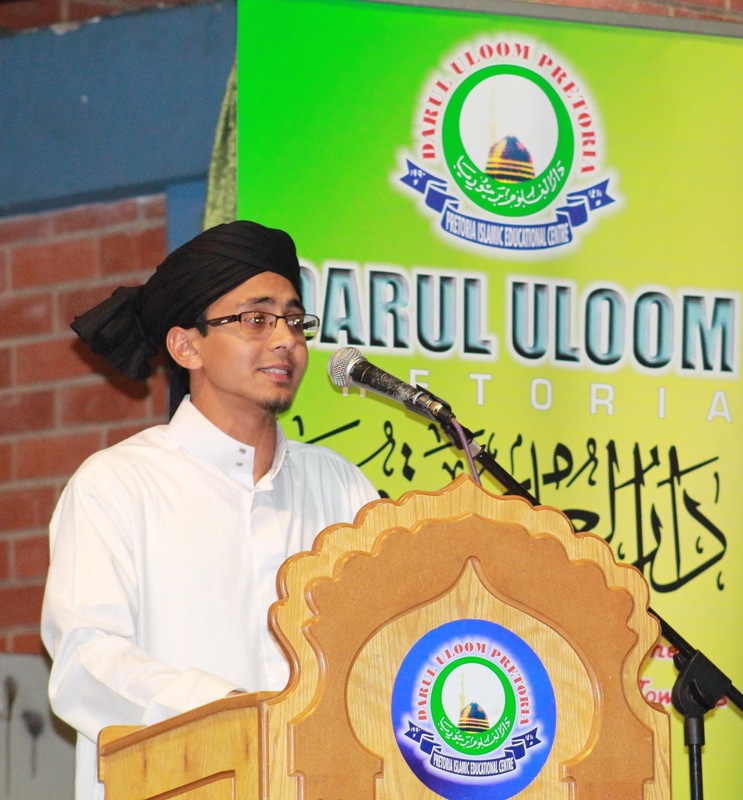 Mohammed Furqaan is a fifth year Aalim student and a member of the Darul Ulooms media team who comes from Lesotho. The award and gift was presented to him by Hazrat Peer Allama Muzamil Shah Saheb of the United Kingdom.